ProRec is a program for field workers in Phonetics, Linguistics and Speech Science. It allows researchers to set up a laptop as a portable recording system complete with visual prompts for speakers. ProRec will present timed text prompts for speakers to read out while at the same time recording to disk from a microphone. The advantage over the use of an audio recorder is that ProRec makes on-line checks for signal overload, and saves a prompts time text file along with the recorded audio file. This prompts time file allows indexing of individual tokens in the recording, and even automatic segmentation and labelling. ProRec version 2 now supports 24-bit acquisition devices. Switching between devices and adjusting audio capture level may now be performed within the application. Audio may be saved to WAV files in 16-bit, 24-bit and 32-bit sample format. ProChop now supports 16-bit, 24-bit and 32-bit sample formats. ProChop can now save files with names containing Unicode characters. Version 2.3: bug fixes: better restarting with existing control file, improved overload detection, VU meter display bug fixes. Download the file called prorecddd.exe into a temporary directory. Then find and run the file to unpack and install. Operation of ProRec is controlled by a configuration file stored in a simple text format. This specifies information about: audio sample rate, number of channels, prompt sections sequence, word lists to be recorded, templates to format display of tokens, and slide advance mechanism. Word/sentence lists are stored in separate text files. Display templates are stored in HTML format. This allows colours, text formatting, images, and special fonts to be used in the displays. ProRec also has a simple mechanism for collecting form information from the screen to record speaker details. After recording, the audio data is stored to a WAV format file and the prompt times are saved to a simple text file. A log file which includes any forms data is also updated. ProRec contains an audio segmentation tool that can be used to chop up recordings into individual files if required - one per prompt. Alternatively the audio and prompts file can be loaded into SFS for further processing before chopping up into individual files if required. An example control file is provided in the "test" subdirectory of the installation. More information about operation can be found in the help file which you can also view here. You will almost certainly be disappointed if you use a cheap microphone connectly directly to the microphone input of any PC. These inputs tend to be of poor sensitivity and add a lot of hum and noise to the recorded signal. To improve things, you should either use an external pre-amplifier to raise the level of the microphone signal to a line level (and so use the line-level input to the PC), or you should use an external USB sound system or USB microphone. ProRec is not public domain software, its intellectual property is owned by Mark Huckvale, University College London. However ProRec may be used and copied without charge as long as the program and help file remain unmodified and continue to carry this copyright notice. Please contact the author for other licensing arrangements. ProRec carries no warranty of any kind, you use it at your own risk. The filenames are taken from the prompt id codes in the ProRec word list file. 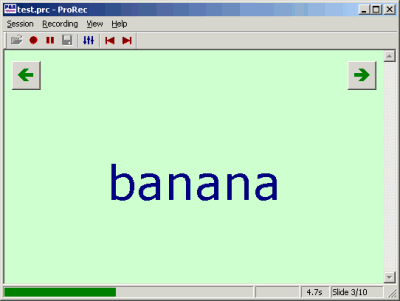 Prorec is a free Windows PC program for prompting speakers with lists of words or sentences and recording their speech back to disk. More information.